Figure 1: This shows the spectra of a Cepheid without a companion (bottom) and the spectrum of a B-star (top spectrum). 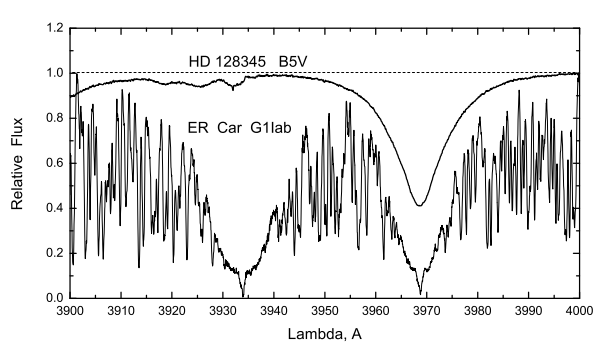 As we can see, the Balmer line from the B-star nearly overlaps with the Ca II H line of the Cepheid. This is also Figure 1 from the paper. Cepheid variable stars are perhaps most famous for serving as standard candles in the cosmic distance ladder. The periods of their variability are related to their luminosities by the period-luminosity relationship (now sometimes also called Leavitt’s law). This was first discovered by Henrietta Swan Leavitt over a hundred years ago but this relationship is something astronomers are still working to improve today. Astrobites has also discussed Cepheids and other variable stars and the cosmic distance ladder in previous posts. Though the physics behind Cepheid variability is well-understood, we still have significant difficulties to overcome in order to improve the zero-point of Leavitt’s law. Cepheids are supergiants. They are stars several times the mass of our Sun that have evolved off of the main sequence of the stellar color-magnitude diagram (in other words they’re in the stellar ‘afterlife’). Because bigger stars burn their fuel faster than smaller stars, Cepheids are also young stars. Thus they are often found in the dusty regions of galaxies so we have to deal with absorption, reddening, and dust scattering when we observe them. The period-luminosity relationship may also have a dependence on metallicity (the fraction of atoms in the star that are heavier than helium) that we still don’t fully understand. Another common problem that we face when using Cepheids—and the focus of today’s paper!—is the presence of a binary companion.In fact, more than 50% of Galactic Cepheids are expected to have at least one companion. The number of Cepheids with binary companions is so high that we can’t deal with them by simply throwing out the ones that have companions. Separating the luminosity of the Cepheid from its companion is important if we want to use the period luminosity relationship. Cepheids, like most stars, are often found in binary systems. Fortunately, since binary systems are incredibly useful in astronomy in their own right, astronomers have many ways of detecting them using spectroscopy, photometery, and astrometry. For one thing, observations of binary stars are pretty much the only way we can directly determine the masses of stars that aren’t the Sun. Today’s astrobite, however, focuses on a method of detecting binaries that is useful specifically in finding the companions of Cepheids. Figure 2: Figure 3 from the paper, showing the spectra of the two Cepheids for which they discovered blue companions. We can see that the Ca II H line on the right is “deeper” than the Ca II K line on the left. The authors of today’s paper used the “calcium-line method” (we’ll elaborate more on this in a minute) to study 103 southern Cepheids. 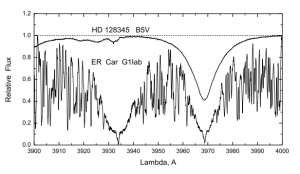 This allowed them to identify a new blue binary companion to the Cepheid WW Car and independently confirm another recent discovery of a blue binary companion to the Cepheid FN Vel. They were also able to extract the known blue companions of eight other Cepheids. To do this, they used spectra taken with the MPG telescope and FEROS spectrograph and focused on the 3900-4000 angstrom range to study the depth of the calcium lines Ca II H (3968.47 angstroms) and Ca II K (3933.68 angstroms) and also the Hϵ line (3970.07 angstroms) of the Balmer series. In Cepheids without blue companions, the depths of the two calcium lines will be equal (see Figure 1). However, if the Cepheid has a blue (hot) companion, then the Hϵ line of the blue companion will be superimposed with the Ca II H line, causing it to be deeper than the Ca II K line. Thus, by studying the relative depths of these two lines, they were able to identify Cepheids with hot companions. This method works for companion stars that are hotter than AV3 stars (hence the “blue” moniker in the title) so they were also able to see the increased line depth in Cepheids with previously-discovered hot companion stars. To make sure that they were not affected by lines from Earth’s atmosphere, the authors also made observations of blue stars at the same time as their Cepheid observations. Spectra for WW Car and FN Vel can be seen in Figure 2. They then search the literature for other evidence of binary companions for WW Car and FN Vel. 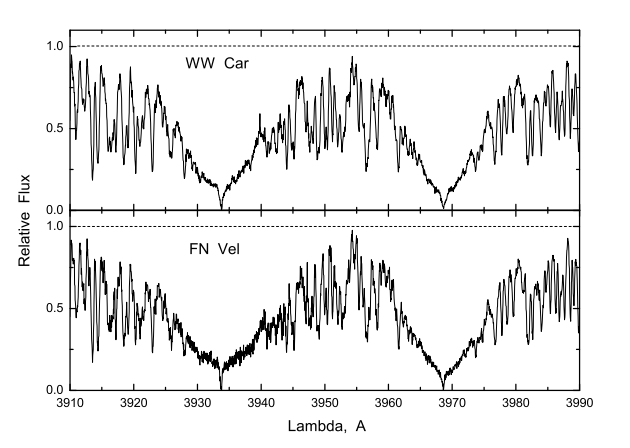 FN Vel’s binary companion had been discovered independently and WW Car had previously been suspected of having a binary companion because of its photometry. 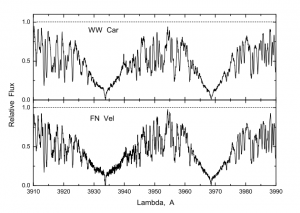 WW Car’s pulsation period also seemed to display a long-term sinusoidal variation, which the authors speculate could be attributed to the light-time effect that is sometimes seen in binary systems. This is caused by the light traveling different distances to reach us as the Cepheid orbits about the system’s center of mass. Danish astronomer Ole Rømer actually used this to calculate the speed of light in the 1600s! Figure 3: The O – C Diagram for WW Car (Figure 4 from the paper). We can see the sinusoidal variations in period that the authors speculate may be caused by the light-time effect of a binary system. 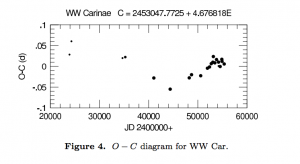 WW Car’s varying periodicity can be seen in it’s O – C diagram (observed minus calculated) in Figure 3. An O – C diagram shows the difference in time from when we expect to see a certain phase of the Cepheid (the ‘calculated’ part of the diagram) and when we actually see it (the ‘observed’ part of the diagram). If the period isn’t changing we’d see points that would be best fit by a horizontal line because the dates that we expect for the Cepheid to be at a certain part of its phase–say the maximum–would be about the same as when we actually see the maximum observationally. 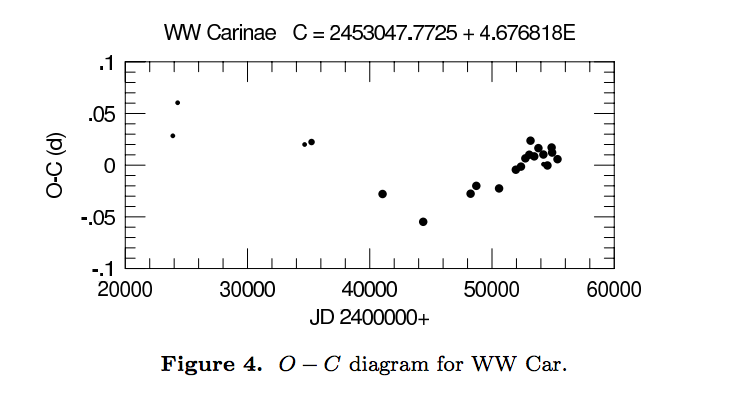 In WW Car’s case, they see this wave-like structure in the O – C diagram, so they suggest that this could be more evidence for the existence of the blue companion they detected in their analysis of its calcium lines. There are, however, a few limitations to the calcium-line method. For example, the Cepheid observations were generally made at the peak of their light curves to give them the highest signal-to-noise ratio possible, but the best way to search for Cepheid companions is to look when the Cepheid is at the minimum of its light curve. This particular method, as noted earlier, is also effective for stars that are hotter than the AV3 spectral type, so it wouldn’t work on less massive companions. Nevertheless, as the author’s of today’s paper have shown, looking at the relative depths of a Cepheid’s calcium lines can be a very effective way of uncovering the secret companions of Cepheids. Is it possible for Cepheids to have companions that aren’t quite so hot or is there some physical understanding of why their companions would be very blue? (I imagine since cepheids are young there is a lot of material for formation available, but how do you know that most of it doesn’t go to the cepheid and the companion ends up having less material/being cooler?) If the companions were cooler, could a similar method as to that discussed in the paper using different spectral lines work? Chris: There are plenty of low mass Cepheid companions. See 1995, ApJ,445, 393 (old but still pretty accurate). This is a pretty basic question, but you stated that Cepheid variables have evolved off of the main sequence already, but that they are also young stars. Does this mean that all Cepheid variables start as M dwarfs (or the like)? Could the binary system’s periodicity have an effect on whether or not the Hϵ line of the blue companion will be superimposed with the Ca II H line? Does the Cepheid blocking the blue companion during an observation prohibit this effect? Very cool that you can use spectra to determine the characteristics of companion stars. Do you know if this method used in other systems besides Cepheid binaries? Is it more accurate to look at the timing variation of a single spectral feature as is done here rather than the variation in total flux? Is this sort of study being done on other types of variable stars? Interesting. Do you think that one day we might be able to use even binaries to calibrate the distance ladder? Is it possible to use this method to distinguish the luminosities coming from the Cepheid star and the companion star? Or is this spectral analysis primarily used for identifying companion stars? Are there predictions of what fraction of Cepheids have such blue binary partners? It seems like it would have to be relatively small (even if there fraction with binaries of any temperature is high), since the Cepheids themselves have already had time to evolve off the main sequence, so any really hot companion would need to be nearly ready do so as well.